And that means, that the fist issue of 'Wednesday Comics' is hitting comic stands nationwide today. 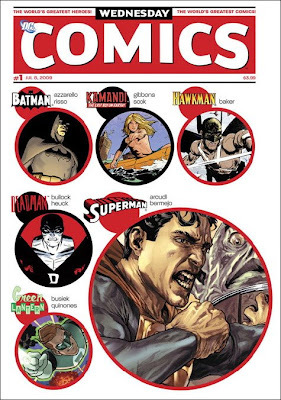 "DC Comics gives a fresh twist to a grand comics tradition with Wednesday Comics, a new, weekly 12-issue series by some of the greatest names in comics today! 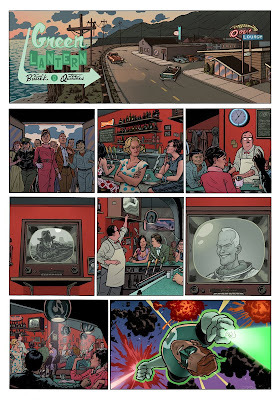 "Wednesday Comics is unique in modern comics history: Reinventing the classic weekly newspaper comics section, it is a 16-page weekly that unfolds to a sprawling 28" x 20" tabloid-sized reading experience bursting with mind-blowing color, action and excitement, with each feature on its own 14" x 20" page." Yours truly, and brilliant writer Kurt Busiek are responsible for the Green Lantern story within. Though if that's not enticing to you, there are plenty of absolutely amazing artists and writers to choose from. Mike Allred. Paul Pope. Neil Gaiman. Kyle Baker. And on and on. You really should be heading to the comic shop now. I hope you all enjoy it! Awesome Joe! Congrats! I'll be picking it up today at my comic shop! I've been holding off on looking at the previews because on page is one week I don't want to spoil. But geez, that page was just brilliant! I mean, you really put me there in that diner. Just incredible sense of atmosphere! Can't wait for the action next week! Truly a grand work of art, Joe--totally drool-worthy! Can't wait to grab my copy! Congrats! Simply a beautiful effort. I'm looking forward to seeing where all the strips are going--and it's cool to think of them as comic strips--but definitely up there is your Green Lantern! The colours are particularly swell and you really capture a very 50s rocket age vibe with your facial features and whole "look." Pope's Adam Strange and Sook's Kamandi also stand out! The whole project is really cool, this whole other reading experience where the comic is treated as more of an art object again. Just want to say everything I've seen so far from you has just really impressed. Love the beautiful acting, expression, and color. Your strip is definitely the one I'm looking forward to the most. Can't wait to see more!!! Thanks so much everybody. Really glad to hear my work and the book in general being received so well. Good gravy, sir! Thanks for the compliment. I'm absolutely loving your Superman story as well. Can't wait to pick it up. Hope you and Maris are well. I'll see you guys around one o these days. Random meet-ups in the street don't happen enough. Liked it. Can't wait till next week.